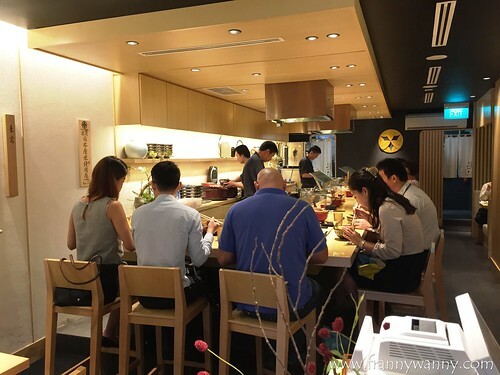 While dreaming about ebi tempura, I suddenly remembered the time when D and I met up with our former colleague, R. We decided to check out the then newly-opened Tendon Ginza Itsuki which is owned by our favorite ramen chef, Kaisuke Takeda. He also owns Keisuke Tori King in 100AM, Tonkotsu King Four Seasons in Bugis and my other favorite, Gyoza King in Orchid Hotel. 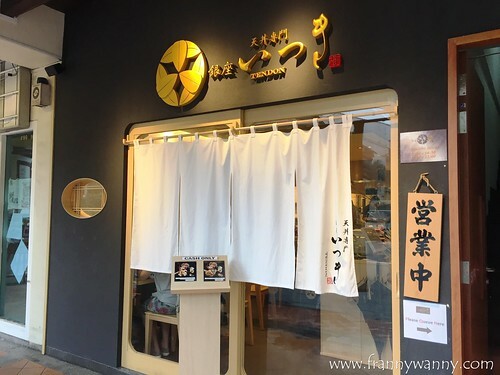 Just recently, he also opened Ramen Keisuke Lobster King in Clarke Quay which I have yet to visit. I just love Keisuke's restaurant concepts as he maintains the menu to be very simple and straightforward all the time. 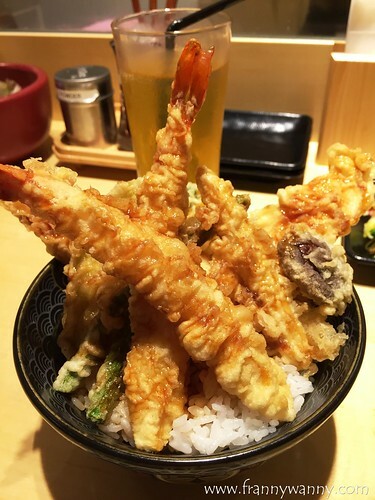 Take the Tendon Ginza Itsuki, for instance. It only serves two items -- Special Tendon (S$13.90) or Vegetable Tendon (S$12.90). This made it so easy for us to decide! Of course we went with the Special Tendon bowl which comes with 2 pieces of huge ebi tempura, 2 pieces of chicken tempura, a mix of vegetable tempura and half-boiled egg. All these sit on top of a delicious bed of Japanese rice. It's really a very filling meal as each set is served with a bowl of miso soup, vegetable salad and chawanmushi too. 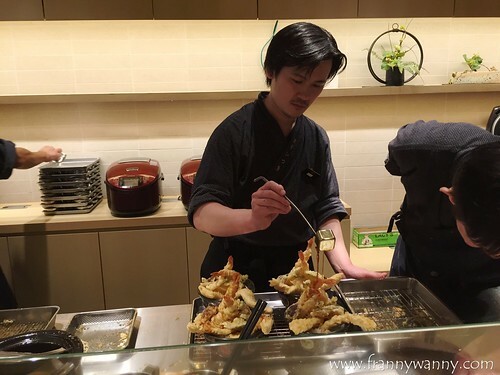 Part of the experience is watching the tempura chefs at work. I love the open kitchen concept as you can see how efficiently they prepare each order. The only drawback is that the exhaust is really bad. We all ended up smelling like deep-fried shrimps at the end of our meal too and we sadly had to head back to the office. Oh, we pity our colleagues who had to bear the awful smell of oil for the rest of the afternoon. Ugh! That's R and D, excitedly watching our Special Tendon coming to life! Aren't they the cutest? Finally, our orders came and we quickly dug in. I have to say that the tempura was superb. Deep-fried to perfectly, I love how the breading was just right. Not to thick nor was it falling apart. The shrimp was huge in size too. Even the chicken was very tender and the vegetables were well-picked. It was so good that I managed to eat the eggplant which I'm normally not to crazy about. Of course, it came with their homemade tempura sauce and white radish which brings makes the tempura even yummier. 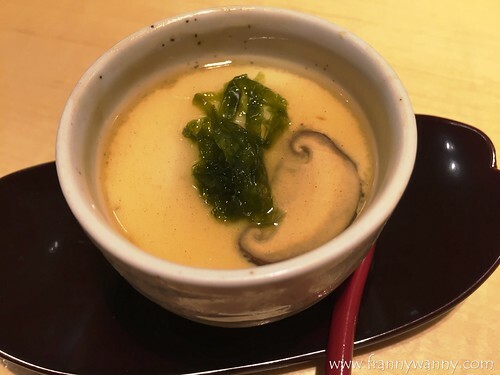 As I was in tempura heaven, I also loved the chawanmushi! This is a traditional Japanese egg custard that's baked with some seafood or a small piece of chicken cube. I love this very much but since it's also very high in cholesterol, I try to limit my intake. Well, having it with tendon is such a good way to enjoy a bowl of chawanmushi, don't you think? They also served a bowl of miso soup which I'm 101% sure Paul will love love love. Unfortunately, I'm not really a big fan of miso but this one wasn't too bad. While I haven't really been around Singapore that long to say that I've tried all of the ebi tempuras in town, I can say though that Keisuke has once again won my heart (and stomach) with this delicious bowl of Special Tendon. I just hope they'd do something with their exhaust as this is the only thing that's stopping me from going back more often. 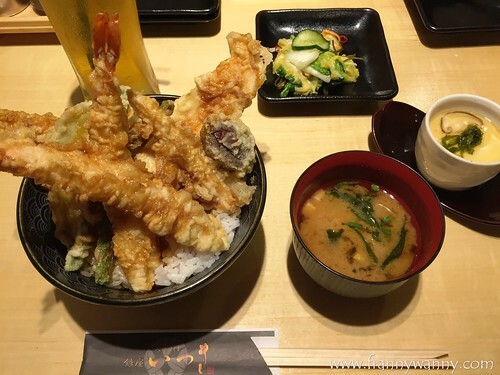 Check out Tendon Ginza Itsuki at 101 Tanjong Pagar Road, Singapore 088522. They're open everyday from 11:30AM - 2:30PM and 5:30PM - 10PM. I suggest that you go early to avoid having to queue up for so long. 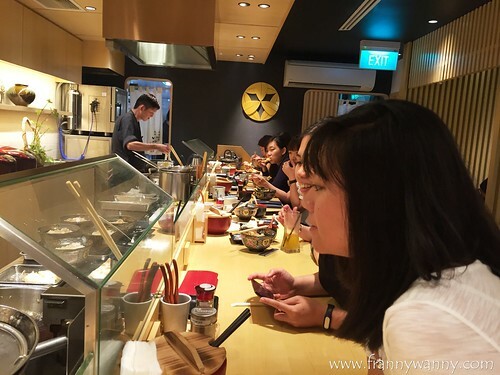 Dont forget to try Ichiran! They have 2 branches in Shibuya. Try also Ikinari Steak. Affordable but so yummy Angus Steak! Nakatayo nga lang while eating. Dont forget to buy Royce and Tokyo Banana in Airport!